Most Italian style meals are centered around bread or pasta. Neither of which make you feel all healthy and light after consuming. However, there is one sneaky, delectable little ingredient you can swap out for pasta. It will drop the calorie count in Mom’s homemade spaghetti by about 300 notches. Spaghetti squash. Yes, it is a vegetable. Yes, it is yellow and stringy and soft like spaghetti noodles. And yes, it is very delicious. Personally, I think spaghetti squash adds MORE flavor the spaghetti than regular pasta. It really plays well with the marinara sauce, amping up the tomato-basil-y flavor. (Look at me acting like I know something about cooking, sounding all Bobby Flay. Pshh.) To make it really taste like Mom’s, skip the jarred sauce and go right to making you own with fresh ingredients. It tastes loads better! Honestly, I would be OK with substituting spaghetti squash anywhere noodles or pasta is required, except mac & cheese because that just wouldn’t work. I’ve included the marinara sauce recipe my family uses and instructions for preparing the spaghetti squash. Pierce the whole shell several times with a large fork or skewer and place in baking dish. Cook squash in preheated 375°F oven approximately 1 to 1-1/2 hours or until flesh is tender, It took about 1 1/2 hours for mine to tender up. Heat a pot of water large enough to hold the whole squash. When the water is boiling, drop in the squash and cook for 20 to 30 minutes, depending on its size. When a fork goes easily into the flesh, the squash is done. Cut squash in half lengthwise; remove seeds. Place squash cut sides up in a microwave dish with 1/4 cup water. Cover with plastic wrap and cook on high for 10 to 12 minutes, depending on size of squash. Add more cooking time if necessary. Let stand covered, for 5 minutes. With fork “comb” out the strands. Choose a smaller spaghetti squash (unless you have an extra large slow cooker) so that it will fit. Add 2 cups of water to slow cooker. Pierce the whole shell several times with a large fork or skewer, add to Crock Pot, cover and cook on low for 8 to 9 hours. When buying spaghetti squash, look for hard fruit that is heavy for its size, about eight to nine inches in length and four to five inches in diameter and with a pale even color. Avoid any squash with soft spots and green color is a sign of immaturity. The average four-pound spaghetti squash will yield about five cups. 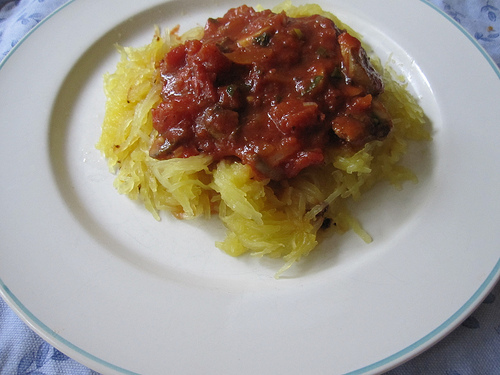 Spaghetti Squash can be stored at room temperature for about a month. After cutting, wrap in plastic wrap and refrigerate up to 2 days. Spaghetti squash also freezes well. Pack cooked squash into freezer bags, seal, label and freeze. Partially thaw before re-using, then steam until tender but still firm, about 5 minutes. 1. Place garlic and olive oil in large sauce pan. 2. Turn heat to medium and cook until garlic is soft and lightly browned. 3. Pour tomatoes in separate bowl. 4. Fill empty tomato cans 1/4 of the way with water and pour in with tomatoes. 7. Bring to a boil, lower heat to a simmer and cook until thickened approximately 20 to 30 minutes. Another great recipe to follow!